Bill O'Brien (left) and Rodney Erickson. Photo by Dave Cole, StateCollege.com. It looks like Penn State’s protracted search for a new university president could intersect with a possible hunt for a new head football coach. There was always that chance, right? After all, since Rodney Erickson announced his retirement it's only been 778 days. And counting. When Erickson signed an employment agreement on Nov. 10, 2011, to become The Pennsylvania State University’s 17th president, it was also the day he set his retirement date. So, it's not like it's a surprise that Rod is a short-timer. He made it very clear when he took the job. From Day One, all the parties involved knew the exact date – or sooner -- Erickson was going to retire as president. That was 111 weeks ago. Another 53 weeks went by until the Penn State Board of Trustees named its Presidential Selection Council. That was Nov. 16, 2012 – which was 406 days ago. Two months after that, on Jan. 18, 2013, the University Presidential Search and Screen Committee was formed. And, just like that, the search was off and running. Then came (the) fall. On Nov. 5, the Albany Times Union reported that Dr. David Smith, head of SUNY Upstate Medical University, was slated to become Penn State’s next president, but was found to be allegedly “padding his state pay without permission.” Smith subsequently quit SUNY and, obviously, was not hired by Penn State. On Nov. 22, Penn State alumni trustee William Oldsey was named to the Trustee Selection Council, the group’s 14th member. Now, here it is Dec. 27, 2013. 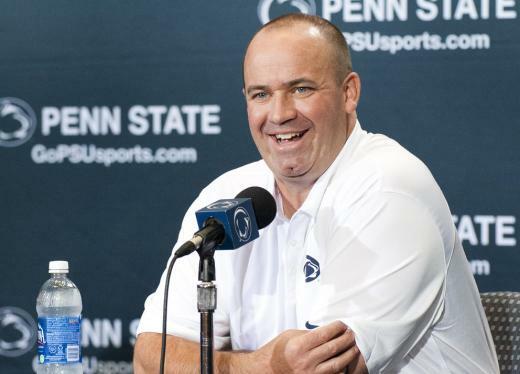 And if the NFL Network’s report on Thursday that Bill O’Brien is interviewing with the Houston Texans is correct, Penn State might need to form another search committee. This one for a head football coach. If O’Brien does leave, that would mean Erickson (an admitted non-football guy) will have hired three head football coaches – interim head Tom Bradley, O’Brien and then whoever is Next Man Up – during his reign. A reign that was always designed to be temporary. Which means, then, that if O’Brien leaves, his successor would be facing the same situation O’Brien faced when he interviewed, when he was hired, when Penn State was nearly KO'd by the 1-2 punch of Freeh and Emmert, when he coached for two seasons, when he met with NFL teams the past two post-seasons and when he left: His bosses now who won’t be his bosses later. Which means that what used to be one of college football’s most stable jobs, even before Joe Paterno, will be a revolving door. Not counting Bradley’s four interim games and the 1949 season coached by Joe Bedenk, Penn State had been a destination job since World War I, with Hugo Bezdek (12 seasons), Bob Higgins (19), Rip Engle (16) and Paterno (46). O’Brien’s been at Penn State for two seasons. When O’Brien was hired from the New England Patriots two Januarys ago, the search drew a lot of fire because of its length and its relatively-unknown final selection. As it was, the process, led by then-interim athletic director Dave Joyner, was long by college football standards but short by Penn State standards. It lasted 40 days from search committee formation on Nov. 28, 2011, to O’Brien’s official signing on Jan. 6, 2012. Now, O’Brien is apparently facing another decision regarding his coaching future. And that Penn State’s presidential future is still very hazy plays a key role in his decision to go post-Christmas shopping. He had hoped to know who were to be his bosses, at both the presidential and athletic director levels, before the NFL regular season ends on Sunday. More than know, actually. More accurately, he’s had a burning desire to have a sense of their a.) direction, b.) philosophy, c.) sanction and NCAA savvy, d.) athletic and fiscal acumen, e.) football program and f.) athletic department commitment, g.) and individual support. At least at the presidential level, O’Brien knows, h.) none of the above. Which could mean, to O’Brien, i.) I am going to see what my options are with the NFL while the iron is (still) hot. It’s not that Penn State can’t act fast when it wants to. Witness the selection of O’Brien. Much more relevant is its recent search-and-sign of Nicholas Jones, Penn State’s new executive vice president and provost by way of New Zealand and Johns Hopkins. The provost is the university’s chief academic officer and, as such, the second-highest ranked employee among the 44,000-plus employees in Penn State’s statewide system. 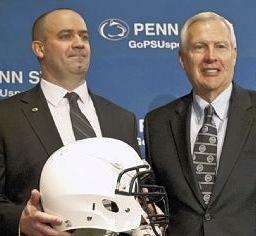 Provost was Erickson’s old job for 13 years before he replaced Graham Spanier. Overall, Jones’ hiring was fast. From start of the search process on Sept. 20, 2012, to the announcement of Jones as the successor to interim provost Robert Pangborn – who replaced Erickson when he became president – on April 29, 2012, the entire process took just 211 days. For its size, Penn State used to be relatively nimble. Penn State head coach Bill O'Brien will interview for the Houston Texans' head coaching position, according to the NFL Network which broke the news Thursday. The interview was reportedly scheduled for after Christmas, meaning that it may happen soon or may have already taken place.